total loss rate of O,. The Ot line represents the contribution from the direct reaction between O, and O (reaction (3.5)). This reaction is responsible for a few percent of total loss in the lower stratosphere, increasing to a maximum of -30% of the total loss in the upper stratosphere. Note that this explains why our estimate of lower stratospheric O, lifetime earlier in this chapter was too large. By considering only the 0 , 0 reaction in our calculation of the Ot loss rate, we underestimated the lower stratospheric loss rate by a factor of -20, leading to an estimate of O, lifetime that was a factor of -20 too large. Virtually all of the Ot loss attributed to NO, chemistry occurs through the N02-N0 catalytic cycle (reaction (3.18)). NO,-catalyzed loss is most important in the mid-stratosphere near 10 hPa (-30 km), where it causes two-thirds of the O, loss. The HO, line represents the sum of the two OH-HO, cycles (reactions (3.19) and (3.20)). The cycle rate limited by H02+0, is more important in the lower stratosphere , while the cycle rate limited by H02+0 is more important in the upper stratosphere. Together, these two cycles dominate O. loss in both the lower and upper stratosphere, where they are responsible for about half of the O, loss. The CI, line represents the sum of the catalytic cyclcs that are rate limited by ClO+O, CIO+HO,, and ClO+BrO (reactions (3.16), (3.21), and (3.23), respectively). Together, these CI, cycles are responsible for about 15-25% of O, loss throughout the stratosphere. It should be noted that mankind is responsible for approximately 80% of the chlorine in the stratosphere in the late 1990s, and is therefore responsible for the vast majority of the loss due to the CI, cycles. In this way, human society has significantly increased the total loss rate of O, in the stratosphere. Finally, the Br, line (not shown in Figure 3.8) represents the sum of the bromine catalytic cycles, which are rate limited by BrO+HOn (reaction (3.21)) and BrO+O. The cycle limited by BrO+O was not discussed previously; it is the bromine analog to the ClO-Cl cycles. The Br, cycles are responsible for -20% of odd-oxygen loss around 50 hPa (-20 km), declining rapidly with increasing altitude. These relative rates should be considered a general guide. The importance of the various catalytic cycles to O, loss rate as well as the total O, loss rate varies with latitude, season, aerosol surface area density, and other geophysical parameters. Also plotted in Figure 3.7 are the 24 h average total O, production and loss rates. In the lower stratosphere, production exceeds loss. This is not troubling because the lifetime of O, is weeks to months (e.g. see Figure 3.6), so the system is not in the photochemical steady state, and we do not expect production and loss to be equal. As one goes to higher altitudes, the O, lifetime decreases. Above -10 hPa (-30 km), the system is in a steady state, and one expects average production and loss to be equal. Between about 30 and 40 km, this is indeed the case. Above -40 km, however, predicted loss significantly exceeds predicted production. This is a long-standing problem with our understanding of upper stratospheric photochemistry and is known as the model "ozone deficit" |64,71,75,76]. Simply stated, models of the upper stratosphere tend to predict lower O, abundances than measurements indicate. The reasons for this remain a topic of active research. 1. It has been suggested that one way to combat the decrease in stratospheric O, is to manufacture O. and transport it to the stratosphere. Let's look further at this idea. (a) Estimate the total number of molecules of (X in the atmosphere. Given this many O, molecules, how many molecules of O, are there in the atmosphere? (c) Given a lifetime of O, of 3 months, what is the power required to maintain the atmosphere's Oa. 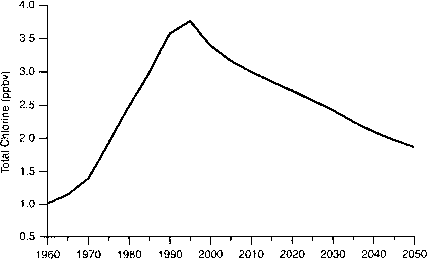 (d) The total energy consumed by society during 1987 was -80 x 10'" J. How does this rate of power consumption compare with the power necessary to maintain the ozone layer. Would it be feasible (just from an energy point of view) for mankind to maintain the ozone layer? CIO + NO CI + NO, CIO + o —> CI + o2 CI + O, -> CIO + o. (a) Calculate [Cij and [CIO], assuming the photochemical steady state. (c) Assume kVhu, is doubled (to 2x10" cm' molecule 1 s '), with all other rates as given above. Recalculate [CI], [CIO], and the rate of CIO + O. How much of an impact on the rate of odd-oxygen loss does this reaction rate have? (d) Assume ¿no+(, is doubled (to 8 x 10 " cm' molecule ! s '), with all other rates as given above. Recalculate [CI], [CIO], and the rate of CIO + O. How much of an impact on the rate of odd-oxygen loss does this reaction rate have? (e) In words, explain why this result is consistent with the concept of a "rate-limiting step". 3. Let us estimate the abundance of upper stratospheric ozone. In this problem, we start by making the assumption of photochemical steady-state conditions between O , and O. (a) Using just the Chapman reactions, write an equation in terms of the relevant ks, 7s, and [O,], [O], and  that equate production and loss of odd oxygen. (b) The equation in (a) contains the concentrations of both [O,] and [O]. Using the steady-state relation between them, eliminate [O] from the equation. (c) Solve this equation for  using typical values for the upper stratosphere (at 35°N; 3.1 hPa; equinox conditions, 3x10 '" s '" for Jih (daytime averaged), 2x 10 1 s 1 for JQ (daytime averaged), 2x 10 l> cm' molecule 1 s 1 for i'tM) , 8x 10 i7 cm' molecule 1 s ' for A0+0) (effective bimolecular rate), and 1.8 x 10"' molecule cm ' for ). Measurements of ozone from the UARS MLS instrument reveal O, concentrations of -6.5 x 10" molecules cm ! at 3.1 hPa. (e) How does this compare with what you calculated'/ Why are these not the same? (f) Recalculate [O,] after including another loss process: CIO + O. Assume that [CIO] = 5 x 107 molecule cm \ and krKM)= 3.8 x 10 " cm3 molecule 1 s '. 4. Estimate in the lower stratosphere given that the lifetime of O, is 3 months. Assume the photochemical steady state (and neglect transport). Based on this estimate, what is the lifetime of O, with respect to photolysis in this region? 5. Around 40 km (where all of the major O, loss pathways involve O atoms), the life time of O, is a day, and the lifetime of O-, is a minute. Based on this, what fraction of O atoms that are formed from 0( photolysis react with 02 to reform (),? produces an estimate of [OJ. By integrating Equation (4.1) over a sufficiently long time (usually several years), an estimate that is insensitive to the initial guess of O, (represented by [O,]0) is obtained. Note that Equation (4.1) determines [OJ at one point in space—models of the stratosphere simultaneously integrate Equation (4.1) at many points throughout the stratosphere in order to determine the [OJ field for the entire stratosphere. Many of the important questions in atmospheric sciences today revolve around estimating how man is changing the atmosphere. For example, the release of chlorofluorocarbons (CFCs) at the ground leads to an increase in the abundance of CIO in the stratosphere (we will discuss this in detail later in this chapter). If one knows by how much the abundance of CIO increased due to the release of CFCs, then Equation (4.1) can be integrated two times: once using the natural level of CIO (the abundance of CIO without the influence of CFCs) and a second time using the perturbed level of CIO (taking into account the influence of CFCs). Comparison of the [OJ determined using these different scenarios shows how the release of CFCs affects O,. (like the addition ol' sulfur compounds to the stratosphere from the eruption of Mount Pinatubo, or the 11 year cycle in ultraviolet radiation from the Sun). In the previous chapter we defined the odd-oxygen family (O j, whose members are O, and O. In a manner analogous to O,, we will define several new families in this chapter whose members include the radicals that are involved in O, loss: inorganic chlorine, Clv; odd nitrogen, NOv; odd hydrogen, HOr; and inorganic bromine, Br,. Before continuing, we will summarize some important characteristics of chemical families. convert one form of Or into another, without changing in the total abundance of O,, at a rate much faster than O, is created and lost. An equivalent way of saying this is that the lifetimes of the members of a chemical family are much shorter than the lifetime of the family. where "other RLS" represents the sum of the rates of the rate-limiting steps of the other catalytic cycles. Note that we have included in the denominator of Equation (4.2) only those reactions that are net losses for O,. Thus, the reactions O, + O and Oj photolysis are not included. O, + O-> O, + O, destroys two O, constituents and reforms the source gas 0;. Not all chemical families have loss reactions. If a family does not have any chemical loss processes, then its concentration continues to build up until the source gas has been depleted. In the early 1970s, measurements of CFCs [771 in the troposphere showed that CFCs were present in abundances corresponding to their total integrated production. CFCs, it was inferred, were not being destroyed, but were simply accumulating in the troposphere. Based on this observation, Molina and Rowland  postulated that CFCs could be transported into the stratosphere where they would be destroyed by high-energy ultraviolet photons. This would result in chlorine atoms being released from the CFCs in the stratosphere, and these CI atoms could participate in the catalytic cycles that destroy 0}. Based on the work of Molina and Rowland , as well as the discovery of the Antarctic ozone hole, the United Nations Environmental Program (UNEP) organized the Vienna Convention on the Protection of the Ozone Layer. This resulted in the signing of the Montreal Protocol in 1987 and the Copenhagen Amendment in 1992, which committed the signatories to cease production of many of the CFCs implicated in O, loss by the end of 1995. For their contributions to stratospheric research, Mario Molina. F. Sherwood Rowland, and Paul Crutzen were awarded the 1995 Nobel Prize for chemistry. It is now known that the scenario suggested by Molina and Rowland  is essentially correct. Halogenated organic molecules, most of which are man-made, are released at the ground. These molecules all have long tropospheric lifetimes, and therefore survive long enough to be transported into the stratosphere. It should be noted that much of the chlorine in the troposphere, such as that in sea salt or volcanic ejecta, is water-soluble  and therefore rapidly washed out by rain. As a result, chlorine from these sources does not reach the stratosphere. Figure 4.1 Total tropospheric chlorine. From Table 6.3 of WMO 113], and assuming CH,CI to be 0.6 ppbv. 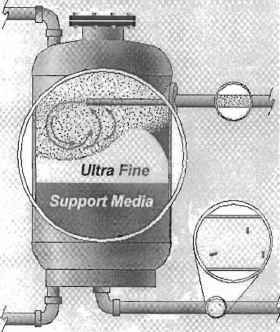 Chlorine amounts prior to the mid-1990s are based on measurements. Chlorine amounts after this time are estimates based on adherence to the Montreal Protocol and its amendments. useful molecules. Tropospheric chlorine peaked near the beginning of 1994 . and is presently decreasing, owing primarily to the reduction in CFC production stipulated by the Montreal Protocol. Because transport time between the troposphere and stratosphere is slow, the concentration of total chlorine in the stratosphere corresponds well to the tropospheric concentration of 3-5 years earlier [81-83J. This suggests that the amount of chlorine in the stratosphere is expected to peak between 1997 and 1999 and decline thereafter. Measurements indicate the abundance of organic chlorine in the troposphere peaked in early 1994 at -3700 pptv . Of this, about 3 ppbv of chlorine was contained in the major CFCs, chlorinated hydrocarbons, hydrochlorofluorocarbons (HCFCs), and halons. Virtually all of these molecules result from human activities. Most of the rest was attributable to CH,C1 (methyl chloride), the main natural source of chlorine in the stratosphere, which is produced from algal growth in the marine/aquatic environments (see WMO , Section 2.2.3). Satellite data have also confirmed that the dominant sources of chlorine in the stratosphere are man-made organic chlorine molecules , Table 4.1 lists the major organic chlorine molecules and their tropospheric abundances. Table 4.1 Tropospheric abundances of chlorine source gases for the stratosphere in the mid 1990s.